The total includes 83,290 of the 170 V series. The model was designed before the war by Hans Nibel. The 170 series could be divided into two: the 170 V and 170 S. The "S" types appeared in 1949 with a slightly larger body. It resembled the 170 V. Both types were available with a diesel engine. 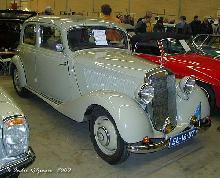 The first six-cylinder overhead valve and camshaft engined Mercedes appeared in 1951. Mercedes was back to its former position and was able to supply more expensive cars again, such as the Mercedes 300 which was sold as four-seater saloon and convertible to wealthy persons.